Great Riverside golf deals are as close as Jurupa Hills Country Club. This Billy Bell designed gem opened in 1960 and has providing a memorable experience for golfers of all levels ever since. Jurupa Hills is a par 70 public course that measures 6,124 yards from its back tees and plays to a rating of 69.1 and a 122 slope. A line of majestic trees guards well-groomed fairways while strategic bunkers force players to drive accurately off the tee. 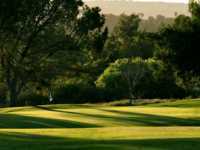 The top feature for many players is Jurupa Hills immaculate and challenging greens, making the course a pleasure to play from end to end. Jurupa Hills Country Club tee times extend from the early morning to late afternoon with deals available throughout season. It all adds up to some of the best Riverside tee times around. Jurupa Hills also features a well-maintained grass driving range that is open from sunrise to 3:30 p.m. seven days a week and a sizeable putting green. Lessons are available through the pro shop that includes video swing analysis and one-on-one or group sessions. Tournament packages are also available, complete with contests, scoring, prizes and range balls for warm ups. Away from the course, Jurupa Hills is a great destination for weddings, parties, corporate events and fundraisers. A friendly staff is ready to meet any needs.